1. Grenerally, you can follow the instructions of the Permenant Care Label as bellow. 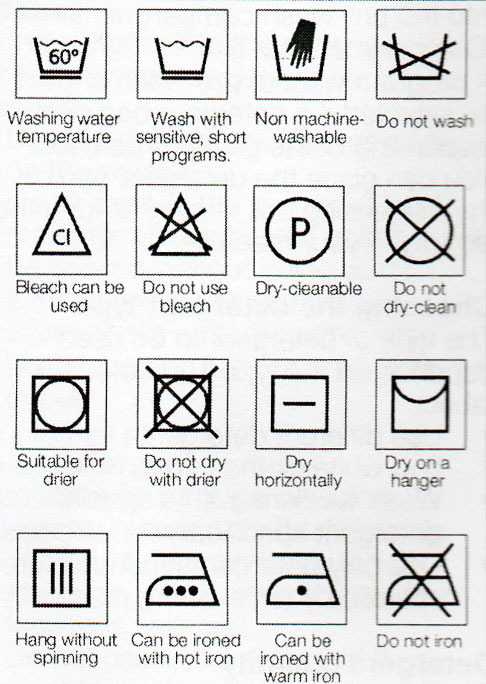 Here are some common symbols. Note: Do not wash colours and whites together. New, dark coloured cottons may release a lot of dye. Wash them separately. 2. We also provide you some wash and care advices according to the scarves fabric/material. Classic and easy, cotton is staple for its ability to be laundered and its durability. It’s a cool fabric, perfect for all season wear. Wash: But cotton get wrinkled and deep stain very easily. In order to wash cotton scarves, first pre-treat stains if any with cleanser and always use warm water to wash.
Dry: Cotton gets shirked on too much drying so keep drying time shorter. Hang it on clean hanger and place it in mild sunlight making inside out. Use warm iron smoothly and gently over all area of fabric for a soft and flat scarf. Silk scarves for women are most valuable accessory they posses. Silk is the most delicate fabric in comparison to any other so need that level of soft touch also. Wash: To wash them – get a silk detergent from store and prepare a solution by pouring then in clean water (below 300 Celsius). Soak your scarf atleast for 10-15 minutes and stir it with your hand. For serious stain massage it gently. Resin it gently in water to washout detergent. Dry: Roll the scarf in clean and soft towel and press delicately to dry to wring out water. Hang it on hanger and dry place away from direct sunlight. Iron: Be carefull and make sure keep temperature at silk setting. Wool is used as winter scarves or shawls, they are the most effective way of keeping oneself warm in winters. Wash: Woolen shawls can be washed as any other garment most preferably woolens. Dry: Dry them on direct sunlight making inside out. After drying, wrinkles might cause a problem because woolen shawls straighten up the wrinkle on its own but give atleast a day for rest. Iron: If you still need to iron them then make use of pressing cloth to cover as a hot iron can damage the fabric of woolen scarves severely. If possible use iron with built-in steamer, so the moisture will take care of heat. Savvy Shopping Tips: You could find the Fabric/Material desicription showing on each product page (at the right side of product image).